It has been a long while since my last post for sure and there are several reasons, or just one... LIFE! Things (professional readings, workshops, and my PLN) are continuing to push my thinking as an educator and therefor my classroom evolves to reflect my beliefs of what is important. Some of these changes are readily observable like the switch from desks to tables and pencil boxes to tool trays and others are less observable and more fundamental, like the move from well planned thematic units to trying to study my students and plan curriculum in response to their experiences and needs (emergent/responsive curriculum), or creating my own report card to communicate my student's learning in meaningful ways. The need for reflection is strong, and as I'm learning, necessary for true learning and growth. It takes time and effort for me to remove myself from home life for some much needed "think" time. This year I'm working on taking that time at home and in the classroom. I've been reading much on the teaching philosophy in Reggio Emilia, Italy. It is beautiful and causing a fundamentally changing view of the child as an independent and capable individual, worthy of directing their own learning. This is very much a learning experience that I'm working through in my classroom. I'm currently participating in a series of after school workshops focussing on documentation as well as involved with a group of colleagues working on an inquiry project looking at how Pedegogical documentation can direct student learning and curriculum. This documentation requires effort during the day to stop being busy and observe the students. Observing - taking note of "ordinary moments" (this has been our challenge from our workshop homework), recording them, interviewing the student about their thinking, reflecting on the moment, sharing the moment with both colleagues and parents. Revisiting the moment with the class. I think this gives value to the experience of the moment and shares the learning perhaps providing scaffolding to students who didn't experience the moment. Provides a "spark" to ignite further exploration or a problem to solve that becomes part of our social responsibility. The spark or problem provides me the opportunity to weave in the curriculum in a way that is relevant and connected to student's experiences. 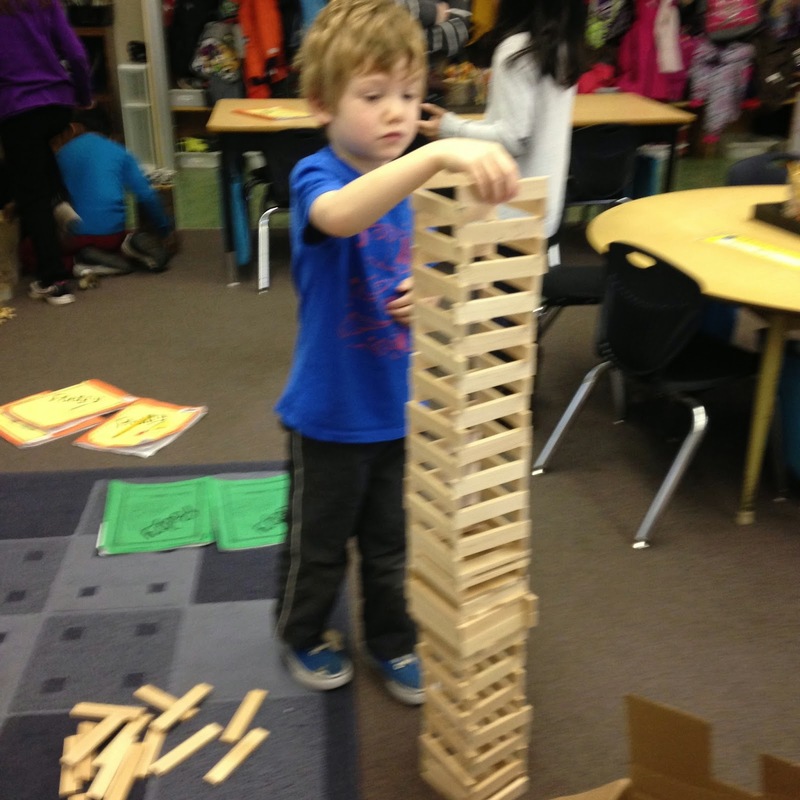 This was a moment of unstructured exploration time where this student was concentrating on his building. I noticed he was positioning the planks differently than previously built structures. I sat and watched. As the tower became taller he drew the attention of other students who came to join him. I observed his reaction to the loss of his solitary experience as it became a shared structure. As the structure grew so did the noise. Then I heard him sternly command that everyone "don't shout because the sound vibrations will cause the delicate tower to fall". While I took note of his words and asked him to elaborate, not many of the 6-7 year old students did. I then grabbed my phone and asked for a further explanation to video. As is the case with all class towers, this experience ended with a truly "epic" crash. I was excited to have witnessed this moment, but I was further excited when I shared the written documentation with colleagues who shared my excitement and encouraged me with descriptive feedback. They asked questions "Had I noticed …." and suggested possible directions for further experimentation using sound vibrations. This moment has sparked our current investigation. We revisited this moment on video with the class and formed the theory to be tested as a group. Many students are involved in testing this theory. Results to date show that our voices (even at maximum volume) are not capable of crashing the delicate towers. Students are not willing to admit defeat and are committed to experimenting with varying "delicate designs". I am working on supporting them with good questions and soon new materials that we might see the effects of these sound vibrations on. It is hard to take the time to let students experience the cognitive struggle to make sense of the experience and truly learn instead of me feeding them the solution. Is this type of documentation realistic in a classroom where time is precious and needs are many? There are things I don't get to in the day in order to spend time listening and documenting. What is the best way to display this documentation that makes it relevant to students? I'm experimenting with digital methods (the Keynote app is working well), printing it and posting on walls and in folders in the class library. Will these investigations come to a natural conclusion or will I have to move it along before it's concluded? Currently students are spending much time on them, but the learning is deep.